Pirates of the Caribbean: The Curse of the Black Pearl is a 2003 British-American adventure film and first installment in Walt Disney's Pirates of the Caribbean series. The story depicts an upstanding young blacksmith who enlists the help of an eccentric, dishonest pirate to rescue the beautiful young woman with whom he is in love and who has been kidnapped by cursed, undead pirates. This film is released July 9, 2003 in United States. [after a cannonball from the Interceptor blows a hole in the Black Pearl] STOP BLOWING HOLES IN MY SHIP! [to Elizabeth] Look! The moonlight shows us for what we really are! We are not among the living, and so we cannot die. But neither are we dead! For too long, I've been parched of thirst and unable to quench it. Too long I've been starvin' to death and haven't died. I feel nothin'. Not the wind on my face nor the spray of the sea, nor the warmth of a woman's flesh. [steps out into the moonlight, revealing his skeletal form] You best start believin' in ghost stories, Miss Turner. You're in one! You're off the edge of the map, mate! Here, there be monsters! Murtogg: This dock is off-limits to civilians. Jack Sparrow: I'm terribly sorry, I didn't know. If I see one, I shall inform him immediately. [the pair block Jack's path] Apparently there's some sort of high-toned and fancy to-do up at the fort, eh? How could it be that two upstanding gentlemen, such as yourselves, did not merit an invitation? Murtogg: Someone's got to make sure that this dock stays off-limits to civilians. Sparrow: It's a fine goal, to be sure. But it seems to me... that a ship like that one, makes this one here seem a bit superfluous, really. Murtogg: Oh, the Dauntless is the power in these waters, true enough. But there's no ship as can match the Interceptor for speed. 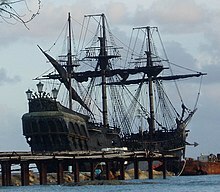 Sparrow: I've heard of one, supposed to be very fast, nigh uncatchable: the Black Pearl. Mullroy: Well, there's no real ship as can match the Interceptor. Murtogg: Black Pearl is a real ship. Murtogg: Yes it is, I've seen it. Mullroy: You haven't seen it. Mullroy: You've seen the ship with black sails that's crewed by the damned, and captained by a man so evil that Hell itself spat him back out? Murtogg: But I have seen a ship with black sails. Mullroy: [sarcastic] Oh, and no ship not crewed by the damned and captained by a man so evil that Hell itself spat him back out couldn't possibly have black sails, therefore couldn't possibly be any ship other than the Black Pearl, is that what you're saying? James Norrington: Well, well. Jack Sparrow, isn't it? Jack Sparrow: Captain Jack Sparrow, if you please, sir. Norrington: I don't see your ship, Captain. Jack Sparrow: I'm in the market, as it were. Murtogg: He said he's come to commandeer one. Mullroy: Told you he was telling the truth! [hands Norrington Jack's effects] These are his, sir. Norrington: [examines Jack's pistol] No additional shot, nor powder. [opens Jack's compass] A compass that doesn't point north. [partially draws Jack's sword] And I half expected it to be made of wood. You are, without doubt, the worst pirate I've ever heard of. Elizabeth Swann: Commodore, I really must protest! Pirate or not, this man saved my life. Norrington: One good deed is not enough to save a man from a lifetime of wickedness. Sparrow: Though it seems enough to condemn him. Barbossa: There are a lot of long words in there, Miss; we're naught but humble pirates. What is it that you want? Barbossa: I'm disinclined to acquiesce to your request. Means "no". Barbossa: Me holds are burstin' with swag. That bit of shine matters to us? Why? Elizabeth: It's what you've been searching for. I recognize this ship! I saw it eight years ago on the crossing from England! Elizabeth: Fine. Well, I suppose if it is worthless then there's no point in me keeping it. Barbossa: You have a name, Missy? Elizabeth: Elizabeth... Turner. I'm a maid in the Governor's household. Barbossa: And how does a maid come to own a trinket such as that? Family heirloom, perhaps? Elizabeth: I didn't steal it, if that's what you mean. Barbossa: Very well, you hand it over and we'll put your town to our rudder and ne'er return. Elizabeth: [she hands it over] Our bargain? Bo'sun: [after a nod from Barbossa] Still the guns and stow 'em. Signal the men, set the flags and make good to clear port. Barbossa: First, your return to shore was not part of our negotiations nor our agreement so I must do nothing. And secondly, you must be a pirate for the pirate's code to apply and you're not. And thirdly, the code is more what you'd call "guidelines" than actual rules. Welcome aboard the Black Pearl, Miss Turner! Barbossa: There be the chest. Inside be the gold. And we took 'em all. We spent 'em and traded 'em and frittered 'em away on drink and food and pleasurable company. The more we gave 'em away, the more we came to realize, the drink would not satisfy, food turned to ash in our mouths, and all the pleasurable company in the world could not slake our lust. We are cursed men, Miss Turner. Compelled by greed, we were, but now we are consumed by it. There is one way we can end our curse. All the scattered pieces of the Aztec gold must be restored and the blood repaid. Thanks to ye, we have the final piece. Elizabeth: And the blood to be repaid? Barbossa: That's why there's no sense to be killin' ya, yet. Apple? William Turner: You knew my father. Jack Sparrow: I knew him. Probably one of the few who knew him as William Turner. Everyone else just called him "Bootstrap" or "Bootstrap Bill". Sparrow: Good man, good pirate. I swear you look just like him. Turner: That's not true. He was a merchant sailor, a good and honest man who obeyed the law. Sparrow: He was a bloody pirate! A scallywag. Sparrow: Put it away, son. It's not worth you getting beat again. Jack Sparrow: Everyone stay calm, we're taking over the ship! Royal Navy officer: [after the sailors stop laughing] This ship cannot be crewed by two men. You'll never make it out of the bay. Jack Sparrow: Son, I'm Captain Jack Sparrow. Savvy? Sparrow: Mr. Cotton: do you have the courage and fortitude to follow orders and stay true in the face of danger and almost certain death? ... Mr. Cotton! Answer, man! Gibbs: He's a mute, sir. Poor devil had his tongue cut out, so he trained the parrot to talk for him... no one's yet figured how. Sparrow: Mr. Cotton's... parrot. Same question. Parrot: Rawk! Wind in the sails! Wind in the sails! Gibbs: Mostly, we figure that means "yes". Sparrow: Of course it does. [to Will] Satisfied? Hector Barbossa: It's not possible. Sparrow: She's safe, just like I promised. She's all set to marry Norrington, just like she promised. And you get to die for her, just like you promised. So we're all men of our word, really... except for Elizabeth, who is, in fact, a woman. Barbossa: Shut up! You're next! Hector Barbossa: Jack, I thought I had you figured. But it turns out you're a hard man to predict. Jack Sparrow: Me, I'm dishonest. And a dishonest man you can always trust to be dishonest. I mean honestly, it's the honest ones you have to watch out for. Because you can never predict when they're going to do something incredibly... stupid. James Norrington: You forget your place, Turner. William Turner: It's right here. Between you and Jack. Elizabeth Swann: As is mine. James Norrington: So, this is where your heart truly lies, then? There's a nice little 90-minute B movie trapped inside the 143 minutes of "Pirates of the Caribbean: The Curse of the Black Pearl," a movie that charms the audience and then outstays its welcome. Roger Ebert, in his July 9, 2003 review of Pirates of the Caribbean: The Curse of the Black Pearl. Over 3000 Islands of Paradise—For Some it's A Blessing—For Others... It's A Curse. This page was last edited on 26 February 2019, at 13:08.